A little rosemary can sing. 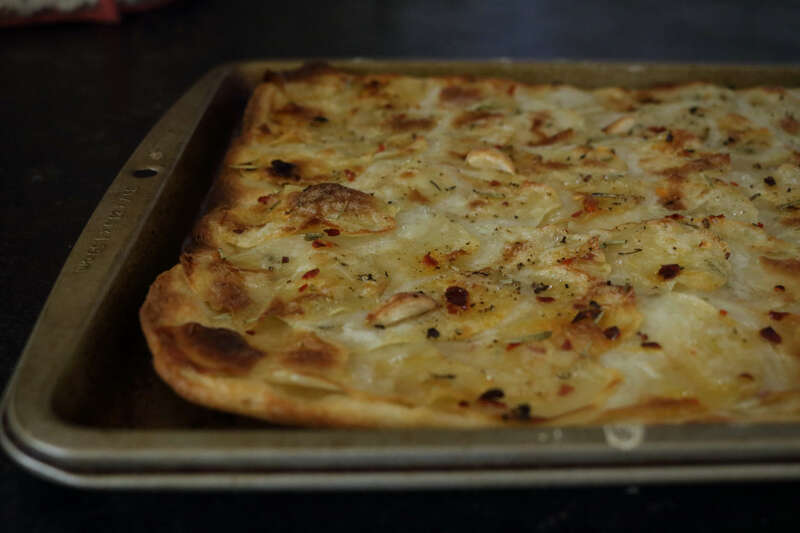 It transformed the humble flour, salt and potatoes into Whole Wheat Potato And Rosemary Flatbread. Frugal and so fundamental, the flatbread made for clean, elegant eating with a chilled glass of white and warm company. Sometimes it takes so little to feel contentment – for me it was an afternoon of rosemary-scented quiet comfort. A flatbread is not the poor cousin of the pizza, but rather an intimate, like-minded friend of the flat-crust pie. Shorn of the weight of flour that pizza crusts carry, a flatbread is a leaner, simpler, fuss-free vehicle for all kinds of delicious toppings. It offers a pleasing crunch to contrast with the succulent morsels littering its top. Mine is a somewhat healthier, whole wheat version. Unlike pizza dough, this one will not double but will rise moderately becoming spongy and light. It is quick, needing just about an hour to rise and all of 20 minutes to cook. Potatoes are the simplest topping but don’t be deceived by their plainness. Thinly sliced into discs(using a mandolin), crisp at the edges and soft in the centre, they become a golden, savoury temptation. And can anyone really resist a bite of salty, rosemary-flecked, olive oil-browned potato? Not really. The important thing here to get the potatoes right, is to slice them with a mandolin into thin (setting 2), even discs. Use a very sharp knife if you don’t have a mandolin. Make them too thick, and they will not become yield their moisture by the time the flatbread is done. Once sliced, I soaked them in warm, salted water for 20 minutes so that they are half cooked. This way they absorb the salt better than if it was just dusted on top and this also helps them crisp-up quickly in the oven. Rosemary, whether you use them as freshly glistening, oily needles or as dried, dark shards, it dresses-up the potatoes into something more aromatic, deeply toasty and sophisticated. It’s a powerful herb, used with roasts and robust stews, so a little goes a long way. 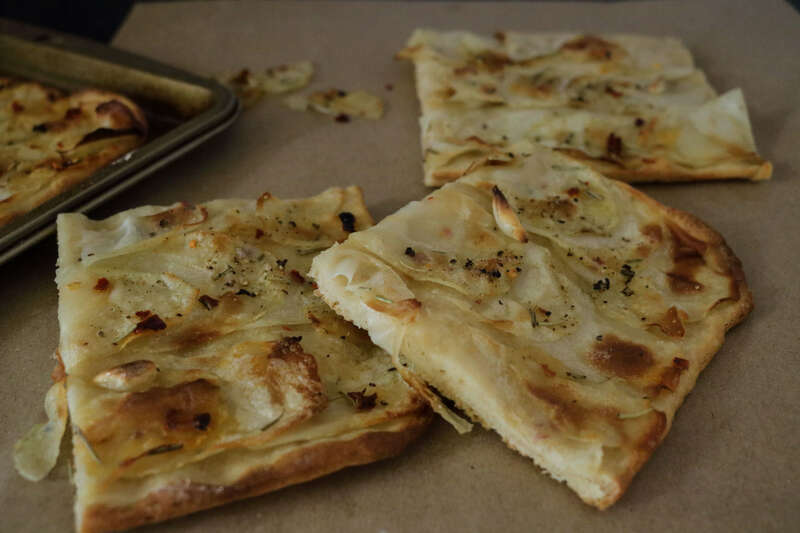 The rosemary can hardly be seen but bite into the flatbread and it blooms on your tongue, filling your senses with savoury intensity. A herb with a pretty name and a strong personality. Rosemary and potatoes are old intimates, comfortable in each other’s embrace. Garlic shines with rosemary, so I threw in a few wholes cloves among the potatoes. Roasted up sweetly golden and squishy, they brought edginess to the flatbread. There’s really not much more for you to do to make this flatbread. Make the dough, while it rests, prepare the potatoes – soak and then drain them on paper towels, finally roll out the dough, arrange the topping and bake. Simple as it gets. A crisp, healthy whole wheat crust topped with golden, wafer-thin potatoes flavoured with rosemary and olive oil. To make the flatbread crust, measure the dry ingredients into a bowl and whisk. Pour in the warm water and olive oil and bind the flours to make a rough dough. Lightly flour a dry surface and knead the dough for 5-7 minutes. Place in a lightly oiled bowl, cover with clingfilm and leave to rest for an hour. While the dough rises, prepare the potatoes. Peel, slice and soak them in salted warm water for 30 minutes. After half an hour, drain the potatoes and place them in a single layer on kitchen towels to get rid of the excess water. This is important, otherwise the potatoes will remain soggy and will fail to crisp up in the oven. Lightly grease a 13"x 9" inch baking sheet and preheat the oven to 220℃. After an hour of resting, the dough will have risen slightly. 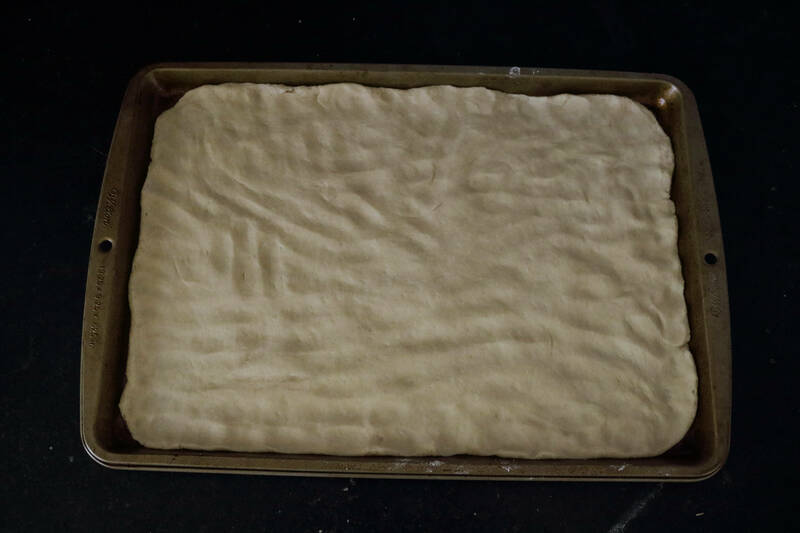 Place in on the baking sheet and using your fingertips, gently flatten and spread the dough to evenly cover the entire sheet. Toss the drained potato slices and garlic cloves in 2 tsp of olive oil, rosemary and chilli flakes so that they are well coated. Arrange the potato slices one row at a time, overlapping slightly. The arrangement will mimic the pattern of fish scales where every subsequent slice is placed halfway up the previous one. In this way, use all the potato slices to cover the surface of the flatbread. Scatter the garlic cloves on top. 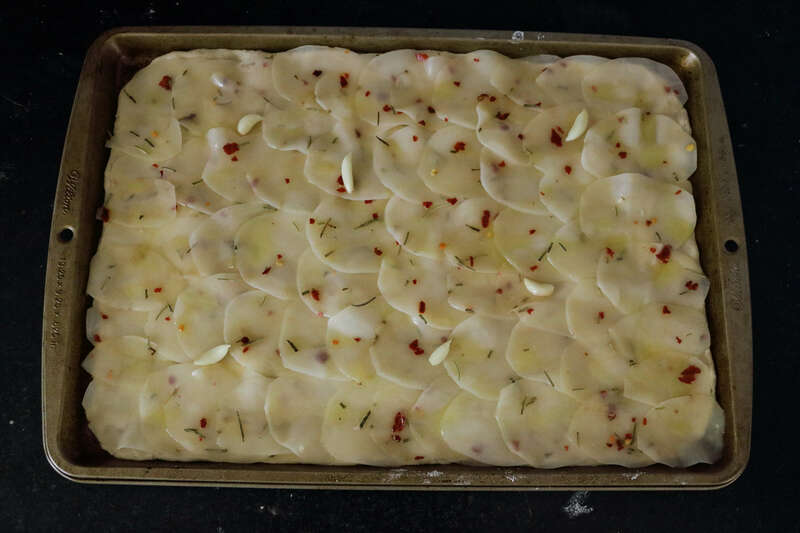 Sprinkle with salt (if required only), drizzle with olive oil and bake in the oven for 15-20 minutes till the crust looks cooked and browned at the bottom and at the edges and the potatoes are golden. Preparation time does not include time needed for the dough to rise. What a great appetizer or side dish! So pretty with that scalloped pattern of potatoes. I bet it tastes wonderful, too! Love your style of writing Supriya!! 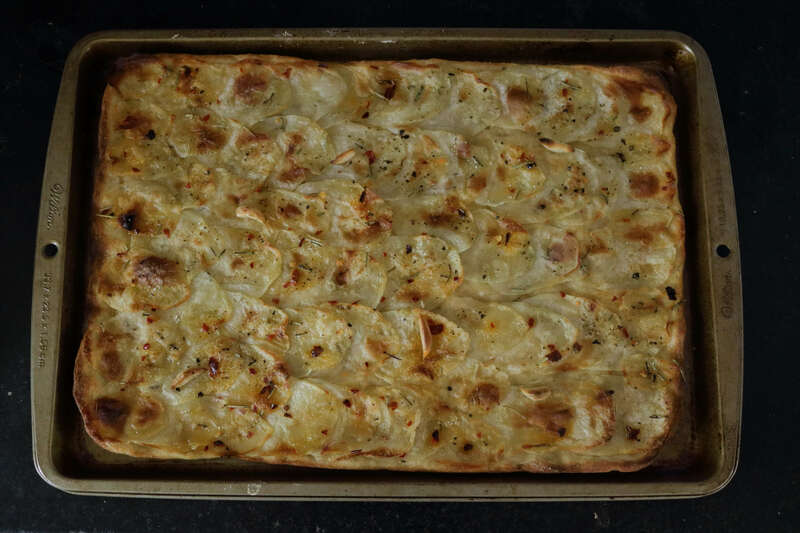 This flatbread looks so appetizing and pretty with those potatoes! Love the shining rosemary flavor! Can’t wait to try! Whenever I am in Germany I order flatbread . There have a lot of different ones . I love the idea to make them with potatoes. 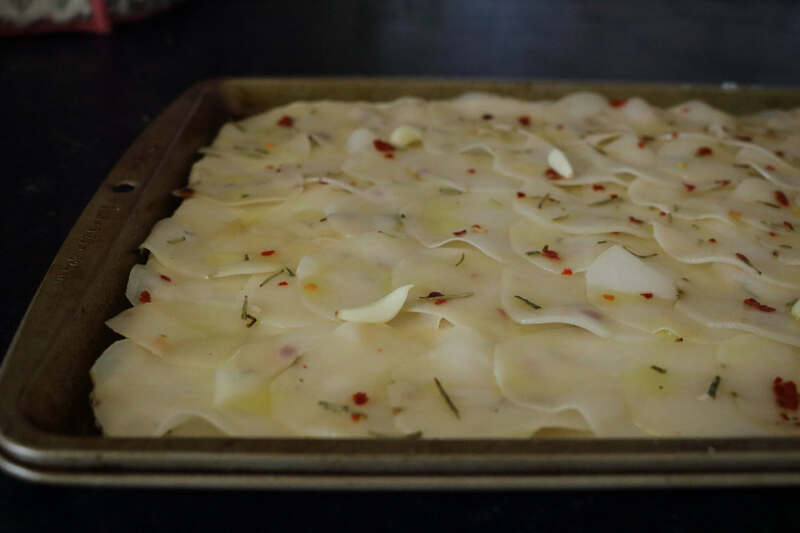 What a pretty flatbread, I love that the potatoes are sliced so paper thin, and pairing it with rosemary is wonderful. This is my kind of bread..I really love that you have used wholegrain here..making this homemade treat even more healthier and tempting for me. This recipe combines some amazing ingredients, Supriya! I can’t wait to give it a try! This reminds me of my trip to Italy two years ago—rosemary growing in abundance and thin sliced potatoes on pizza and bread. This is my memory on flat bread. It looks amazing! The flavor combination is wonderful. I agree Thao, rosemary is perfect with savoury potatoes. What a gorgeous bread Supriya! Love rosemary and potatoes…great combination!! OH, this flatbread recipe sounds amazing Supriya. I love the potato topping. Cannot wait to try it. Thanks for a great recipe. This flatbread looks amazing. I love the potatoes and rosemary on top. Simple but elegant. I love that this is whole wheat! You can always get a win when you serve flatbread for dinner. This sounds wonderful!! First off, let me say that this looks like straight-up comfort-food heaven. I’m really eager to try these flatbreads. Secondly, though, I love your blog in general. It has a really beautiful, sleek, clean layout – very appealing. Your photos are beautiful. Nice work! Feels great to be appreciated Jeff. Thank you!